The productivity and value of any built space is arguably a function of its interior design. That’s why, in educational settings, intelligent interior design matters a great deal. 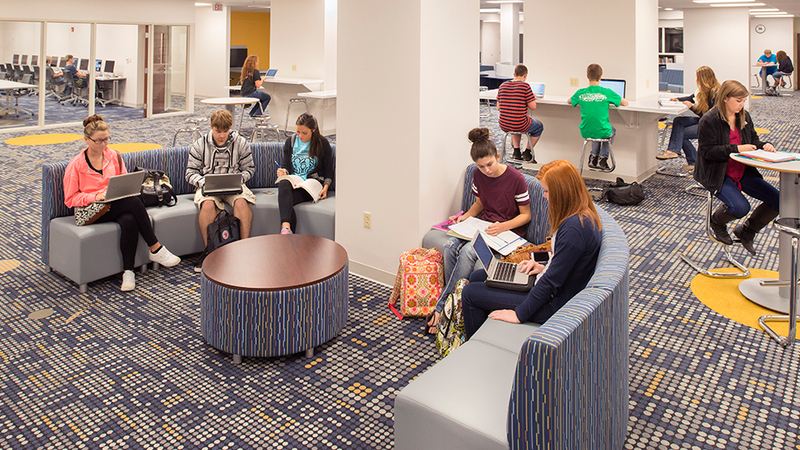 Originally built more than a half-century ago for 400 students, Mooresville High School in Mooresville, Indiana was in sore need of an update and expansion to accommodate 1,350 students and a 21st century curriculum. During the interior design portion of the project that followed, it became clear that the needs of a high school go far beyond new furniture and a paint job. High school curricula have changed significantly over the years. Mooresville students now learn about engineering, advanced manufacturing and biomedical sciences. Modern subjects require modern learning infrastructure, and if a school can’t keep up with the times, neither can its students. Perhaps the centerpiece of the project was the Virtual Learning Lab, a new space built to be the 21st century’s answer to school libraries of decades past. Designers from The Korte Company considered the technology students must use in their work when they furnished the space. The open-concept Lab contains four breakout areas that include stools, smart tables and large monitors hung on the wall. These workspaces include power supplies and USB ports so students can plug in and collaborate on class work. This is part of a bigger trend: High schools and colleges are racing to keep up with the modern workforce. Work spaces are more open. Workers collaborate. Almost everything is digital. High schools that incorporate these design elements ensure more seamless transitions for students into collegiate or technical settings. New classrooms were built and existing ones renovated to include new teacher desks and improved storage areas. A new concourse-style hallway and an updated administrative space complete with added private offices and an alumni conference room rounded out the project. The most challenging part of the project was that school was still in session. Designers and other work crews had to keep in constant contact with each other and with school officials during the 10-phase project, coordinating demolition, construction, deliveries and installations while minimizing disruptions to learning. Another challenge designers faced was the fact that high school students would be using the new furniture. This required choosing more durable tables, chairs and lounge furniture that featured hard laminate surfaces and stain-resistant fabric. Designers and school personnel also agreed that school pride was important, but not to the point of distraction. While the school’s blue and gold are featured throughout the campus, some areas are tempered with whites and grays to allow students to focus. Thanks to the Mooresville community’s commitment to quality education, their new high school is built to equip students for whatever comes next. At The Korte Company, we understand how a school’s construction and design can impact learning. 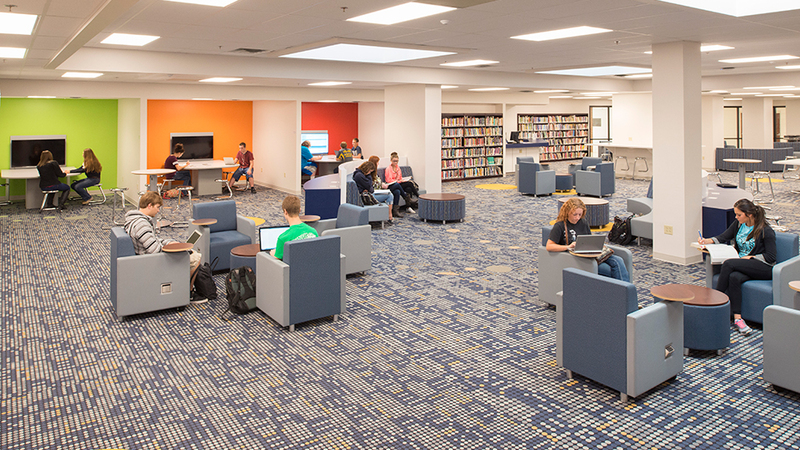 Our Design-Build experts create safe, comfortable spaces where students can learn while making every dollar go as far as it can. That’s why, in addition to all the other improvements made on campus, Mooresville High School is on the cutting edge when it comes to sustainability and energy efficiency. This means the school can refocus every available dollar to the classroom. Learn more about how The Korte Company delivers projects on time and under budget every time, and be sure to read the rest of the Mooresville High School story by downloading the case study below.